‘I might not be as dark as I think’ Sorority Noise vocalist Cameron Boucher sings midway through the sixth track on the bands second record. Art School Wannabe, the song in question, is upbeat and oddly carefree, and the line feels a little off given that it follows Your Soft Blood, which is undoubtedly the darkest track Sorority Noise have released over the span of their reasonably short career, bleak but not barren – a stomping, self-conscious epic of a downer song. Joy, Departed‘s tone is very much reflected by its title, this a record full of mood swings, seemingly happy enough one minute and then not, and it’s an album which is just as likely to leave you aching emotionally as it is aching from bouncing around during its more spirited moments. Juxtapositions rain down left right and centre, but the ever contrasting tones of the band’s music are one of the many reasons Sorority Noise have rapidly become one of the more popular bands within the emo / punk scene following the release of short but sweet but sombre debut Forgettable, which was anything but its title in that instance. When I reviewed Forgettable last year I spent most of the time talking about the records cathartic yet infectious nature, and I’m inclined to do the same here. Joy, Departed is energetic and emphatic, but it’s also weighted lyrically, and Boucher’s poetic lyrics still get to me a great deal, and I don’t mind admitting that. There are very few artists, not just confined to the emo genre, who articulate their emotions as well as he does, and for me this is the strongest side to the record. It’s all very affecting, aided by his melancholic delivery )alongside fellow vocalists Adam Ackerman and Ryan McKenna) and I think the record features his best, and saddest material to date, it’s just accompanied by instrumentals which don’t necessarily stoop to the same lows. Opener Blissfth opens sentimental and ends instrumentally huge, whilst Corrigan showcases an electrifying band dynamic, impossible to resist. The opening two tracks certainly make for a strong start, and from here onwards things rarely lose this established emotional momentum. After several listens, as was the case first time around, I believe almost every song on Joy, Departed to be better than most of the songs on Forgettable, and for a guy who liked the latter enough to splash out on a test press of it that makes the former one of the years strongest releases. 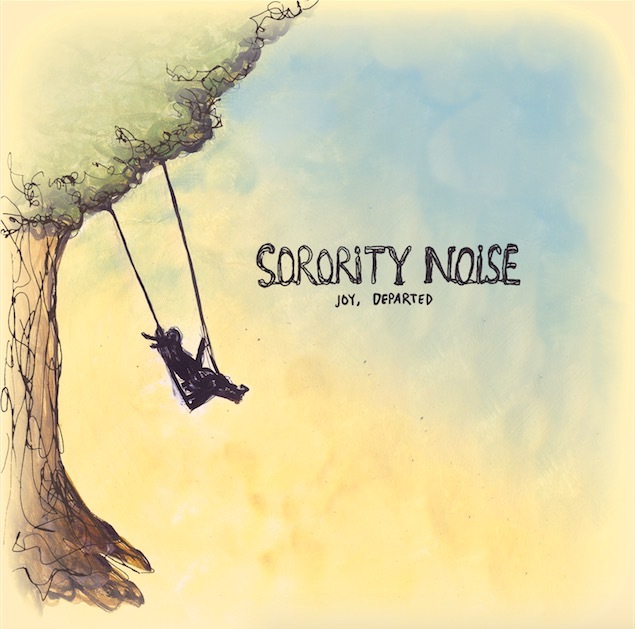 On their second outing Sorority Noise have bettered their debut in almost every way, and it marks an immense progression, surely set to cement the band as one of the forerunners in their respective field. It’s heavy emotionally and sonically, but it’s also often buoyant and cheer-inducing, and its a record which shifts moods constantly and in doing so only serves to highlight how well Sorority Noise capture the opposite ends of the spectrum. The haunting Fucshia flickers thanks to added strings courtesy of Michael Underwood, and it’s the softest song on the record, Boucher lamenting ‘Flower girl I am not what I seem / I am the reason your leaves are withering / My sun has set and I will never keep you warm again/ How I long to be in bloom for you‘, whilst the alternate grungy stomp of Nolsey is suitably big, ‘drain me’ over Drain You. Lyrically, Joy, Departed deals with some highly personal themes, and Boucher’s own anxieties are at the heart of its many finer moments. Boucher’s been outspoken about depression in the run up to Joy, Departed, particularly during the initial release of eighth Using, and although it may seem so lyrically, this isn’t necessarily a depressing record, and when it does sometimes threatens to become one there’s a spark of some sorts to brighten it up a bit. It’s a record which is easy to empathize with regardless of if you’ve shared similar lows, and it’s a record you need to relate to on a certain level in order to get the full impact of the content – however, it isn’t a release intended to drag you down to the same sort of depths as Boucher reflects on throughout. Joy, Departed feels like a release about coming to terms with sadness without dwelling on what it is to be so, and it makes for a release which is cathartic, but also strangely triumphant in the way in which it embraces the darker moments and gives them a life which refuses to limit them to the shadows. Take Using, a track Boucher described as ‘the first song I’ve ever written that I felt took a positive focus on my life’ and is optimistic enough to match that. It’s anthemic and rousing, as is most of Joy, Departed and like all of the record its really well put together, fuzzy bass underlying restrained yet effective vocals before a big chorus kicking off with the line ‘I stopped wishing I was dead/ Learnt to love myself before anyone else’ as raucous and infectious as a song with those lines could hope to be. It’s everything Sorority Noise do so well, and the overwhelming positive slant to it is great to hear after several songs which are painfully sad without always sounding it. The only real complaint I had of Forgettable last year was in terms of its twenty-one minute run-time, and with Joy, Departed clocking in at thrity-five I can’t nitpick the same issue this time around. The longer length allows the band to toy with some longer songs, namely Your Soft Blood and When I See You (Timberwolf) which ride out over five minute rollercoaster’s. They’re grand and expansive, the former in particular, a brooding maelstrom, whilst the records latter closer is a heartrending finale, lyrically crippling as Boucher sings ‘You smell like hospitals / And you look like bad news / And if God is real / I hope he has a plan for you / If the devil is real / Let him know I asked how he’s been / Because when I rid myself of my demons / They must have found a home in you.’ It’s suitably cinematic and sweeping in a way similar to Forgettable‘s Smoke, but it manages to eclipse its younger counterpart, and in doing so ends the record on a high which solidifies how far Sorority Noise have come in so short a time. Everything about Joy, Departed seems to suggest that they’re only going to go further in the future, a bold, ambitious release which carries a special emotional quality and isn’t afraid to lay itself bare. Boucher ended the words accompanying Using with ‘Stop glorifying sorrow and start lending a helping hand to those that need it the most’, and his words seem like a fair reflection of Joy, Departed as a whole. There’s an inspired, warm feel to it which is often captured within the emo genre but is rarely captured this well. These are sad songs which are much more than sad songs, and for me, the way they come across makes the bands second record pretty damn commendable. This is a record to play loud, and if you do need help its more than willing to do so. If you don’t, you’ve still got one of 2015’s strongest releases to enjoy, and that’s a pretty solid reason to pick it up.